If you’re looking for a nutritious and delicious green smoothie designed to support your body’s natural detoxification efforts, look no further. This smoothie contains several of the usual detox suspects along with two potent green superfoods: spirulina and chlorella. This combination of ingredients results in what is perhaps the most potent detox smoothie I’ve posted to date. What’s so special about spirulina and chlorella and how do they help you detox? Spirulina is best known as the “protein queen” because it’s about 70% pure protein. In addition to being a complete protein, this single-celled organism is loaded with essential vitamins and minerals that support a healthy you. Through the process of chelation, spirulina has been shown to help remove heavy metals from the body. Spirulina has been used to remove lead and arsenic from contaminated water and can absorb and remove these metals from the body. Chlorella is a nutritional powerhouse primarily because of its chlorophyll content. The chlorophyll helps the body process more oxygen, promotes tissue growth and repair, and helps cleanse the blood. Like spirulina, chlorella assists heavy metals detoxification by binding to and ushering these bad guys out of the body. These two green superfoods provide a powerful one-two detox punch. For more information on the ways in which lemon juice and kale help your body detox, see my Lemon-Lime-Kale Detox Green Smoothie. If you’re brand new to spirulina and chlorella I recommend starting with a 1/2 teaspoon of each. You can work your way up to 1 heaping tablespoon of each if you’re as ambitious as me :) Enjoy! Place all the ingredients into your high-speed blender and blend for around 30-60 seconds or until nice and smooth. I would love to know if you try this mean green detox smoothie – please leave a comment below. Happy Blending! Ironically, this is my first time reading this article and I have smoothie every morning for breakfast. It gives me so much energy. I’m glad to know I’m heading into the right direction. Thanks! You’re welcome, Ian. Keep up the smoothie for breakfast habit! Preferably wild dandelion greens, but store bought are almost as good. There’s never a better time to start than now. I am new to any type of smoothie and have just started making them for the nutritional value. I know nothing about detoxing but I’ve heard it a good thing to do. Your mean green detoxing smoothie looks great and I’m going to try it but I have no idea how often to have it. Do I just have it once or on a regular basis? Great question. I recommend having a smoothie like this once or twice every couple of weeks. However, you could have it daily for a week to intensify the detoxing – maybe twice a year. 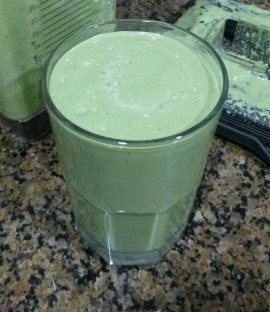 I should also mention that there’s no harm in consuming this smoothie every day, it’s just not that fun to have the same thing every day and there’s a plethora of other healthy ingredients to incorporate into your smoothies. Thank you for your prompt reply Ryan. I’m sitting here as we speak drinking my mean green smoothie. The taste leaves a lot to be desired….I’m drinking it through a straw as the smell is turnng me off of it. I will try and have this smoothie every second day and see how I go. I’m not only using the smoothies for their nutritional value; I’m also trying to lose weight. If there are any particular smoothies you could recommend to excelerate that process, I’d love to see them. An awful lot of sugar. To reduce the sugar content simply omit the honey (or substitute stevia) and/or eliminate or use only 1/2 banana. Mind you the smoothie may not taste as good. Here are two articles on ingredients and smoothies that may be helpful for crafting smoothies for you mom. Additionally, bone broth can be very healing to any sort of digestive issue. I encourage incorporating that into your mother’s diet and smoothies. I have been interested in applying smoothies into my everyday “diet”, but never knew where to start. I recently weighed myself for the first time in a year, and shocked to know that I’ve gained 10 lbs! Can you point me in the right direction please. I want to lose these 10 lbs, over the course of a few months. Can you give me some smoothies that will help? I’m also starting an exercise routine to get more active and healthy this year. All of my thoughts and info on losing weight with smoothies can be found here. Let me get this straight: this has 43g carbohydrates and 25g sugar and you’re saying this is “heatlhy”? Do you have any idea what that amount of sugar does to your pancreas? I really, Really, REALLY suggest you do some research on the matter. This is borderline high in sugar. If you’re watching your sugar intake you can remove the honey and/or banana. The smoothie may not taste as good though. For most people 25g of sugar from natural sources is no problem. For others like a diabetic, this may be way too much. Fruits and veggies contain natural sugar, much of which we’ve bred into them because that’s what we crave. I advise against making smoothies too higher in sugar (sugar bombs) all over on my site. Everyone is unique and needs to take my recipes and make them their own. Too high in sugar, cut back or remove sugary ingredient(s). Not enough protein, add a protein rich ingredient or a protein powder. Need more healthy fats, add avocado, coconut oil, or ghee. If someone wanted to detox in a matter of trying to discontinue the use of a drug, would this smoothie help get through withdraws quicker? Would you have any suggestions on a smoothie that can help get through this kind of time and maybe lessen the amount of days one would be ill from discontinuing the use of the drug? Been researching for someone and noticed this said it removes some serious unhealthy things from the body and was hoping maybe this smoothie would be of some help and use to them. Thank you! Those are great questions, Amanda. Unfortunately, drug withdrawal is a complex thing that I can’t speak to. You should consult a health professional and take steps based on your situation.